Tarpon Fishing Season in Key West Report. April 14 2019 – As winter struggles to keep its grasp on the nations weather over the summer patterns trying to take control for the tropical season we are seeing some dramatic shifts in the weather patterns here in Key West fishing where often times we are at the tail end (so to speak) of these battles of highs and lows. Our weather is constantly changing one day to the next. Winds from the East then the South then from the North West. Its hard to keep track. Fortunately the tarpon that are in town are not hard to find. Capt. Bryson of Dream Catcher Charters puts his angler on this beautiful tarpon. The last week has held up well for Key West tarpon fishing. About average for this time of the year. We are fishing for them strong first thing in the morning and longer for anglers that would like to stay focused on them. There is some bait around and the tides have been favorable. The tarpon although present have been a little more fickle than normal on the bite. 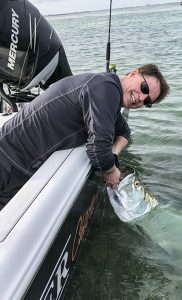 Often times we are finding ourselves in and among dozens of rolling tarpon and limited bites. I guess its better than not seeing them at all. The sharks have been brutal this year so far for tarpon fishing Key West. It seems that the bull sharks are keyed in more than in the past to a struggling tarpon and hunting it down for a snack. More so, it also seems there are many more bull sharks than we are used to seeing. A couple of theories I have. 1. The red tide up on the West coast sent these sharks looking for more productive water. 2. We are no longer killing the bull sharks, therefore more of them. I subscribe to both. These bull sharks are smart like the ones in Boca Grand area. Just a thought. The next week looks like more of the same for ups and downs in the weather. windy conditions at the end of next week starting Thursday will keep the backcountry busy with boats hiding from offshore conditions trying to keep their people happy catching a tarpon or sharks. It won’t be any fun conditions for the flats fishing boats that are trying to catch a tarpon on the fly and to add to that misery the number of Out Of Town fishing guides here to pick on our local supply of tarpon is astounding, crowding out many great fly fishing spots that are typically used by our local Fishing Guides. It was just a matter of time. My guess is that we will have another tough beginning to the migration for tarpon (Starts First week in May) weather wise. We have not had our high pressure Easterlies yet this year marking the change between winter and summer weather patterns. This will be a good thing for the anglers fishing with us. Our bay boats are comfortable to fish out of even when its windy. I will put another report up at the end of next week around the 21st. Till then.. Tight lines. You can check out my web site at Fishing Key West or follow us here at Dream Catcher Charters on Facebook. If you would like to book a tarpon fishing charter please call us. We still might have some slots available to get you out there or know a good tarpon fishing guide that does.